Hola is an online business and a paperless business as well. So it only makes sense to take advantage of the abundance of online tools out there that allow me to store things quickly and easily in the cloud. Keeping me organised… and saving some trees is a bonus too. 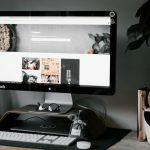 So here are my 5 favourite apps and cloud-based tools for getting organised and staying productive throughout my busy work day. Turns out, the average netizen logs into 25 different websites a day. So it makes sense to use your one easy-to-remember password. Perhaps it’s a mix of your name and birthdate, 25 times. But we all know that’s not the best idea. Passwords are your first line of defence against creepy cyber crawlers. Go easy on your passwords and you may just be a victim of cyber breach. So, while we need to create super strong passwords with a unique mix of letters, numbers and symbols, we also absolutely NEED to remember them! And for that, LastPass is god-sent! This tool remembers all your passwords for you, it’s extremely easy to use and supports almost all major platforms. When you log into a website, LastPass prompts you if you want it to save the password. The next time you visit these websites to log in, you can simply click on the little button and it will instantly fill the login form with your username and password. How’s all this woo woo web magic happen? All you need do is download the browser extension. LastPass allows unlimited stored logins, provides a super strong password generator and allows you to share login details with your teammates. Best of all, it’s FREE! Pro tip: For only $24 per year I got my hands on the LastPass mobile app. Now I can login to all my apps and website accounts on my phone and never have to remember a single username or password. Dropbox is the ultimate when it comes to file syncing, file-sharing and data backup across different devices. It’s like a mobile extension of your computer’s hard drive, only it provides the convenience of accessing your files wherever you are and on any device. I love that it’s simple and intuitive to use. Plus, it makes collaboration super easy. You can easily share files with colleagues, allow them to make changes on the file and view details about file modifications. Dropbox comes with both a free and a premium version. The basic free account comes with 2GB storage space, while the individual premium version, which costs around 10 bucks a month, comes with a huge 1TB of storage. On another note, Google Drive is also a great option. I don’t use it personally just because I jumped on board with DropBox earlier. But I have been invited into some client’s Google Drive accounts and find it quite easy to use. However, I don’t like the user interface quite as much as DropBox. It’s worth checking out both of these options to see which one suits your needs (or your visual style) best. If you’re anything like me you probably write 10 or more emails each day. And ofter you’re writing the same sentences over and over. “Hope you’re having a lovely day”, “Looking forward to hearing your feedback”, “Please let me know if there’s anything else I can help with”, and so on. Perhaps you’ve even thought of the time you could save not having to write these over and over? Thank you, Auto Text Expander! Using this groovy little Chrome extension, you really only have to hit a few keys and the text magically appears right before your eyes. So what’s the deal? This tool lets you create abbreviations that, when typed in, automatically expand into a larger, completed version of the text. It really comes in handy when you use the same hashtags frequently, or common closing sentences in letters like “hth” for “Hope this helps,” or “lftc” for “Looking forward to chatting with you.” Magic! Pro tip: Here are a list of some I’ve set up and would use nearly every day, saving me keystrokes, time and probably a bit of RSI too! popdf = Please open the PDF attached to view your proof. lft = Looking forward to hearing from you. plm = Please let me know if there’s anything else I can help with. loremmm = This one magically turns into 3 paragraphs of placeholder text. You can literally do a brain dump into Evernote! Evernote is a wonderful place to store pictures, notes, relevant articles, documents, ideas, mind maps, and other important info. It basically keeps all your thoughts in one place. I personally use it to store my responses to FAQs and text for email templates I send out regularly like my ‘Logo Design PROOF 1’ template. With a quick copy + paste I’m whipping up and sending out emails in a snap. I use Evernote on both my computer and my iPhone as it syncs seamlessly between the two. Yep! Evernote is freaking awesome. Sign up and give the free version a spin. You won’t be disappointed I promise. 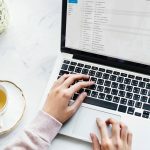 I truly feel if you’re serious about your business you need to get serious about your emails and unfortunately services like webmail, Apple Mail and Outlook are notoriously unreliable. To ensure you can access your emails everywhere on any devise, and that emails aren’t getting lost you need to use a professional, paid cloud-based service. Gmail is one of these. Gmail is part of Google’s G Suite, a cloud-based productivity suite for your business that helps you get work done from anywhere on any device. You get custom email addresses ([email protected]) and more than 30 GB of inbox storage. I’ve used G Suite for my business for over 3 years and have never looked back. It’s secure, with heaps of storage and you can access your emails from any device making it super convenient. You can say goodbye to daggy email signatures. Gmail makes it really simple to create your own email signature. You can even add images and links to your socials. And never again will you see that infuriating ‘outgoing mail server error’ message. The free Gmail app has a beautiful interface and is flawless. In 3 years I’ve NEVER had an issue sending or receiving emails on my phone. Gmail starts from as little as $60 a year and is super easy to get set up if you’re opening a new email account/domain. If you have an existing email/domain, importing your emails over can be a little tricky and you might need to holler at your go-to IT dude (or me) to help out. But once you’re set up, you’re gonna love it! I just had to add this bonus as Boomerang is no doubt the biggest timesaver for me. This tool magically declutters my inbox without losing track of important messages. It always bugs me seeing my inbox clogged with messages I can’t attack today… like questions for that meeting on Thursday or a bill that’s not due until next month. So instead of being harassed by these to-dos, Boomerang hides these emails from me and then shows them in my inbox when I want them to be there. How cool is that? This tool also lets me schedule emails to be sent out automatically on the date and time I want, like on 9am Monday when I’m working on the weekend. I also use Boomerang to remind me when I need to follow up on an email. For example, if my client doesn’t reply to my email requesting feedback by Friday, I can have my email pop back into my inbox prompting me to chase them up. Boomerang for Gmail has a free plan allowing you to use it for up to 10 emails per month. But because I’m a sucker for anything that improves my productivity and declutters my life so I use the Pro plan for US$15 per month. There you have it, 5 of the best productivity apps I can’t live without. Now I’d love to hear your thoughts! What apps have helped you stay productive and organised? 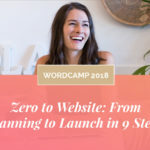 What domain extension should I use for my business?